Happy Monday to you! 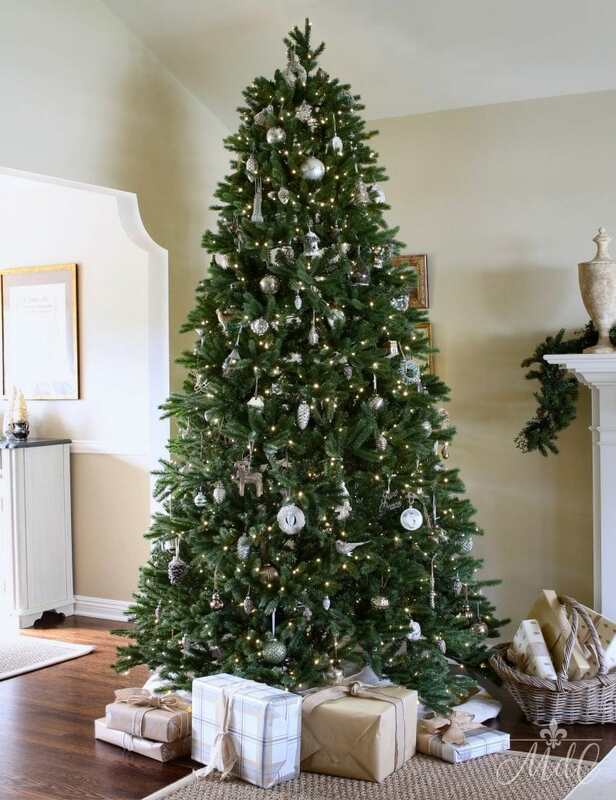 Today is a special post as this is my first holiday tour of the season! 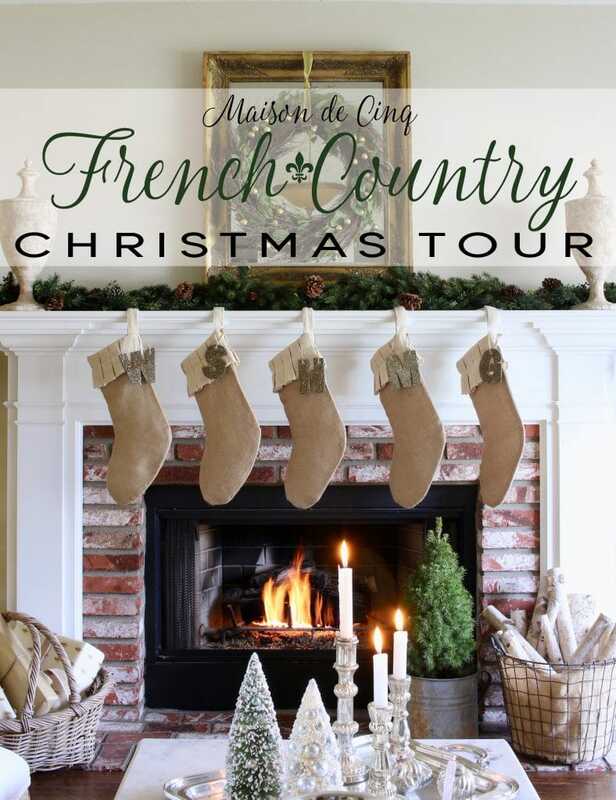 I’m joining six other amazing bloggers to bring you a French Christmas Tour, hosted by my friend Lory of Designthusiasm. Many of the bloggers I’m joining today are people I was reading before I even started a blog. 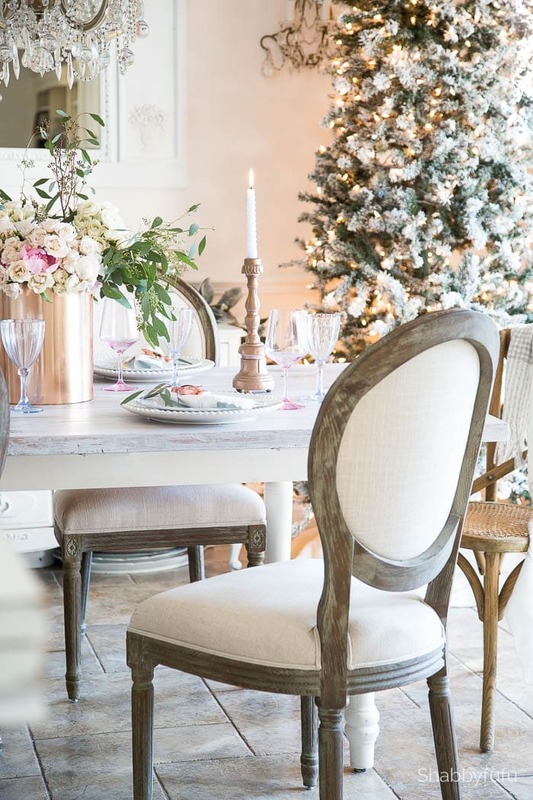 They are immensely talented, with gorgeous photography and styling, so be sure to scroll to the bottom and visit all of their posts! If you are landing here after visiting one of the other blogs, thank you so much for stopping by! 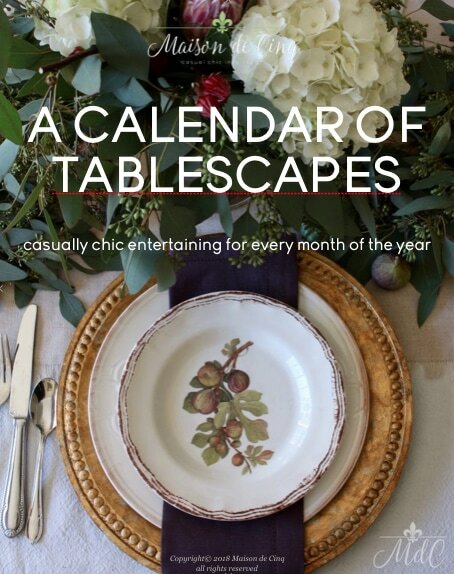 I’m Sheila and I’ve been blogging here at Maison de Cinq for a little over two years. 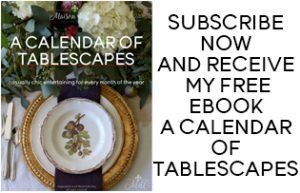 Here I share my love of design, my decorating adventures, as well as entertaining and lifestyle posts. 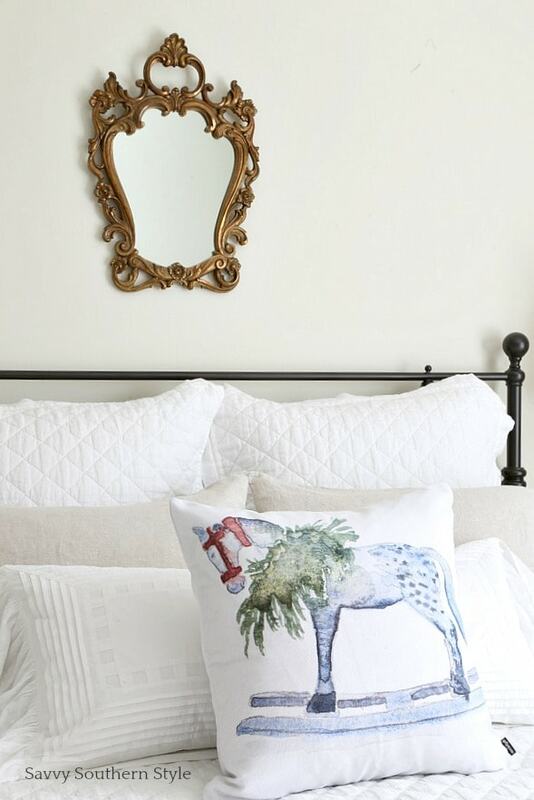 I consider my style “casual chic” but underlying much of what I love, and how I decorate, is inspired by France. 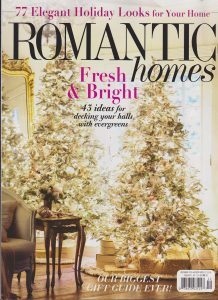 The French style I’m partial to is not the fancy, dressy version, but rather a pared-down version of French Country. I decorate in mostly neutrals, with a pretty clean and simple aesthetic. 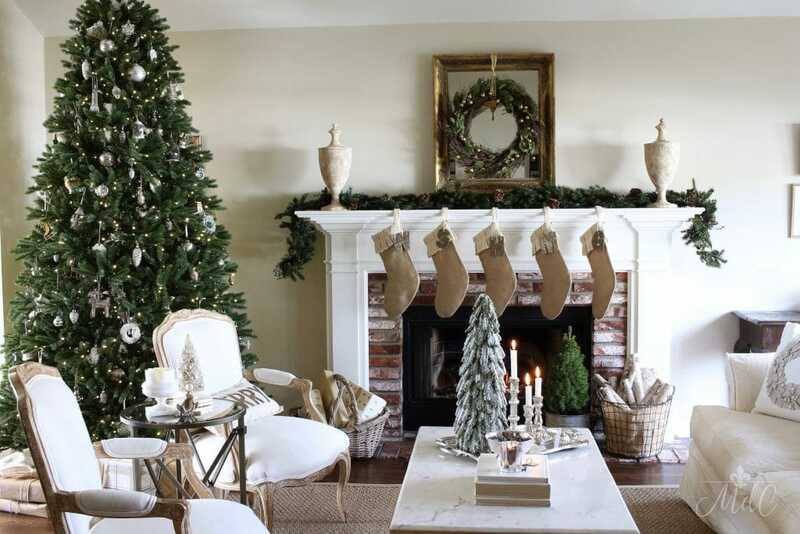 And my Christmas decor is in much the same style. 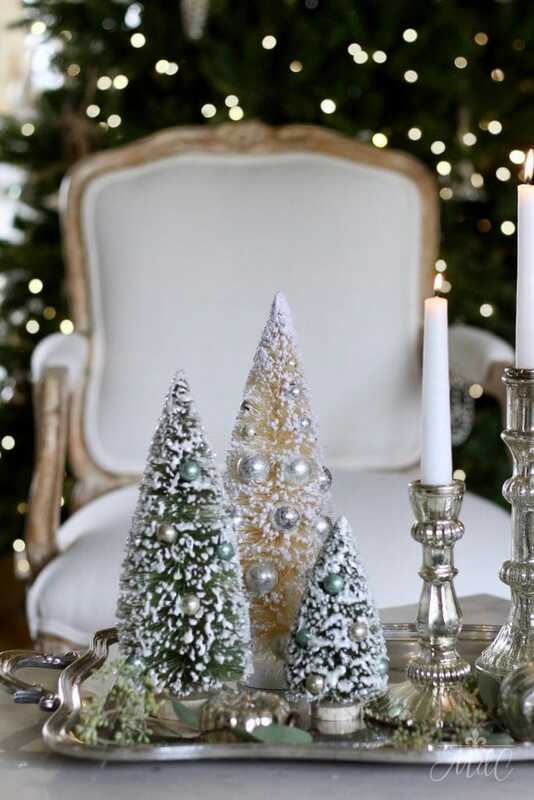 I don’t really do red in my Christmas decor, instead focusing on greens, creams, and whites, with metallics added for some sparkle. 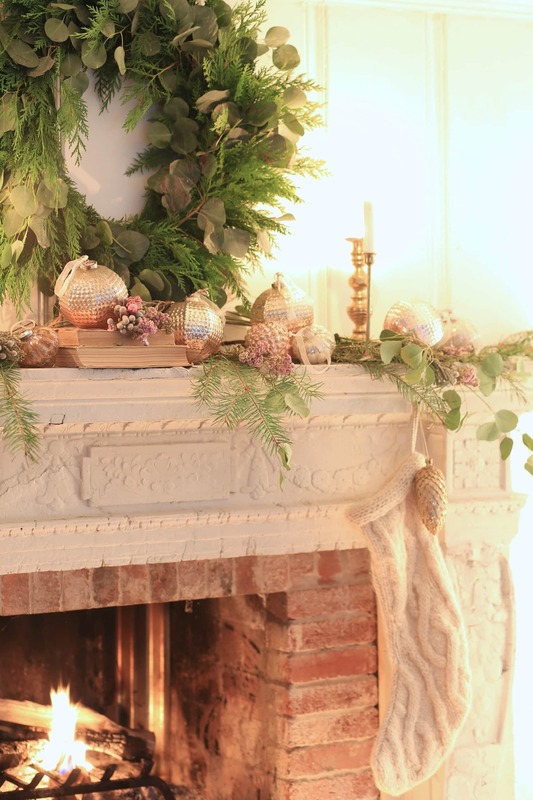 So welcome to my home and my version of a French Christmas Tour….. 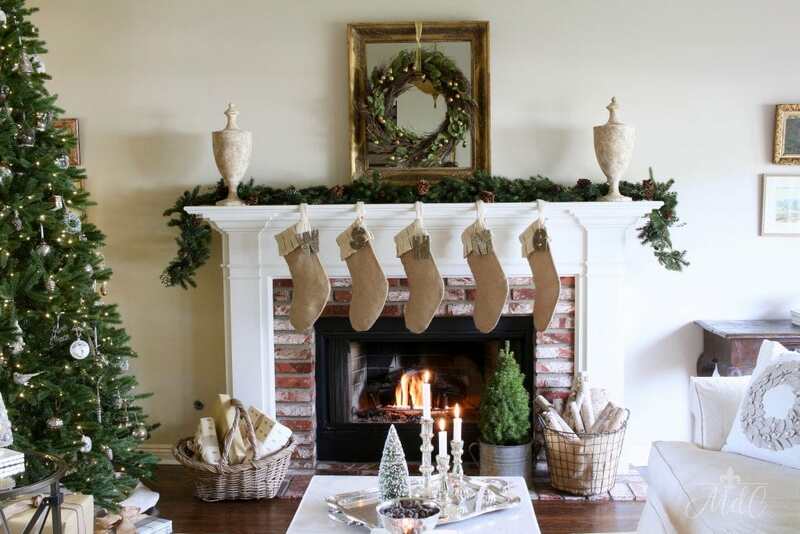 This is the mantel in our living room and where we hang our stockings each year. 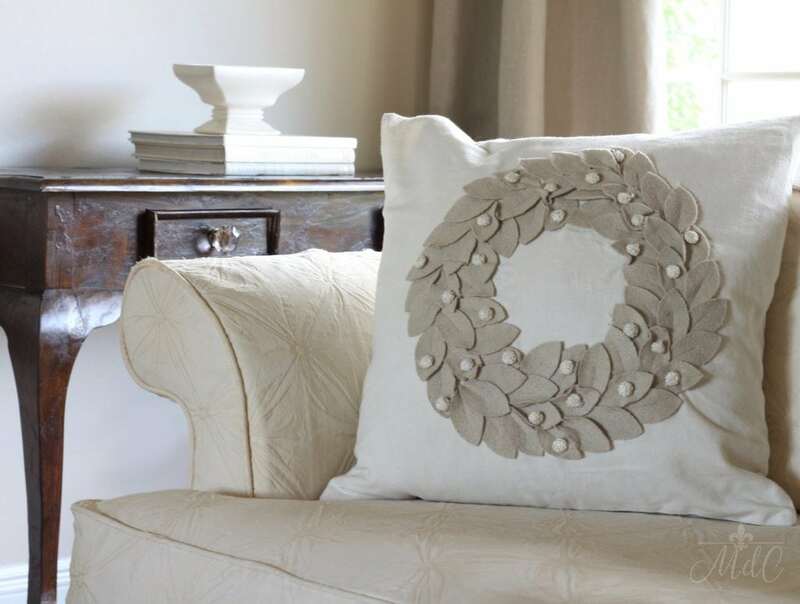 The wreath is an old one from Restoration Hardware, but I love it so much I just keep using it! 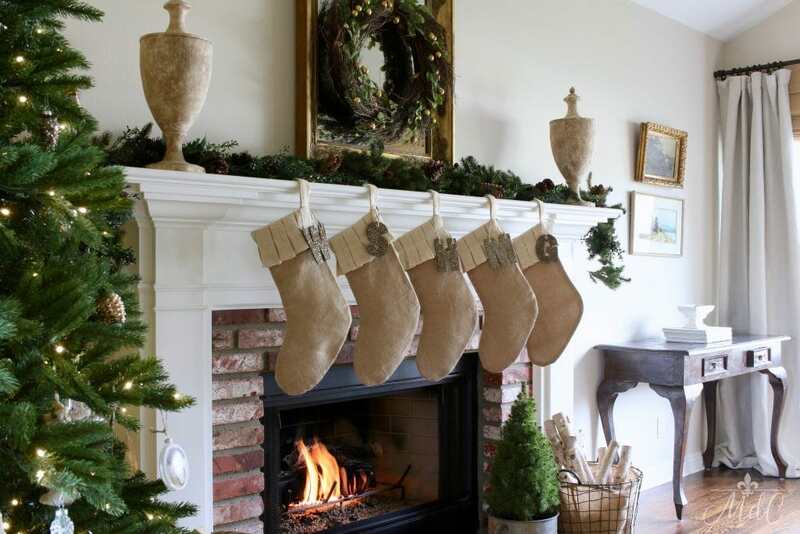 The stockings I found last year at Home Goods. 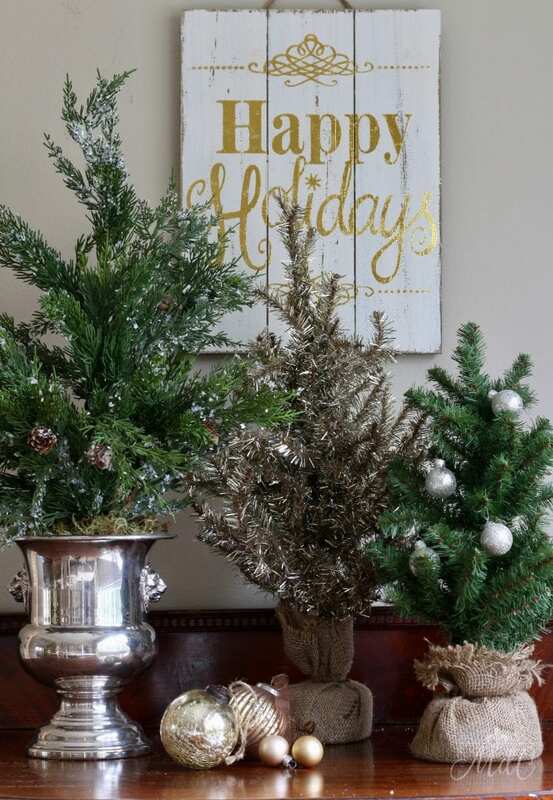 I just love the mix of the rough, casual burlap against the glittery letters on each one! A vintage bucket holds a little live pine tree, and a metal bucket holds our logs. 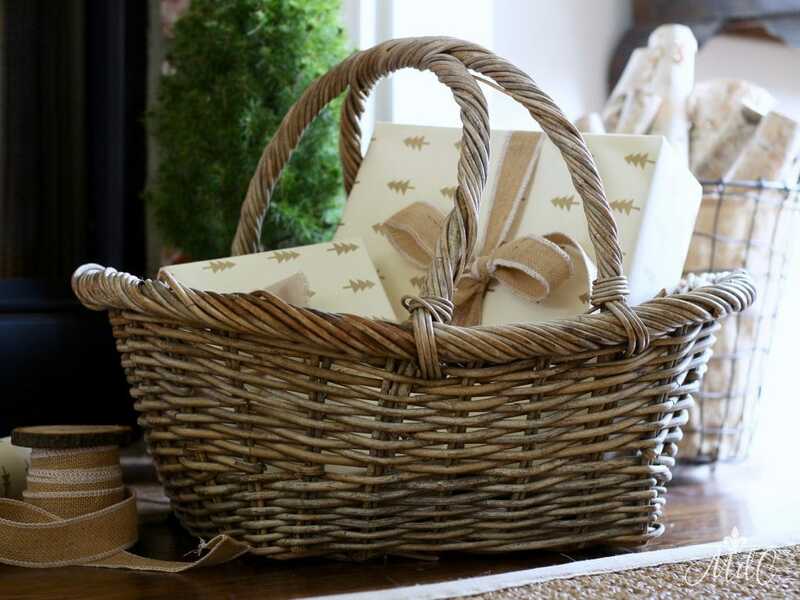 I frequently use vintage baskets and this is one of my favorites. I love the shape and the color, and it’s French! 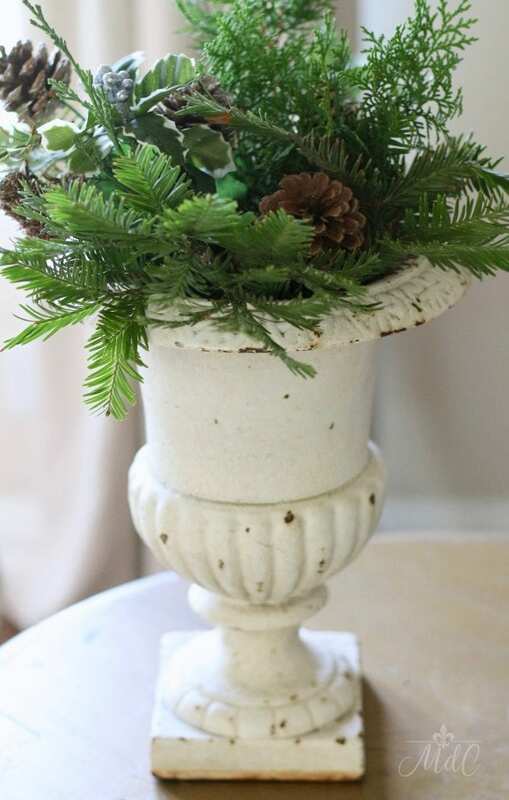 One of my vintage French cast iron urns holds some clippings and pine cones from the trees in our backyard. 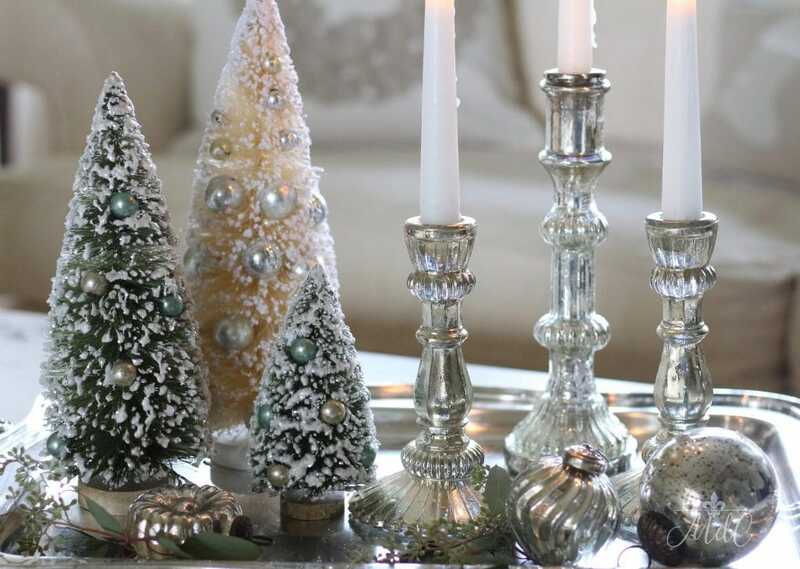 Here I grouped some bottle brush trees with mercury candleholders on an antique silver tray. I love bottle brush trees! Their old-fashioned charm just speaks to me. Mine are a mix of vintage and reproduction. These candleholders I recently chalk painted and could not be happier with the new color! It’s actually only the second time I’ve used chalk paint and I have to say, I’m hooked! Looking from our living room into the dining room. 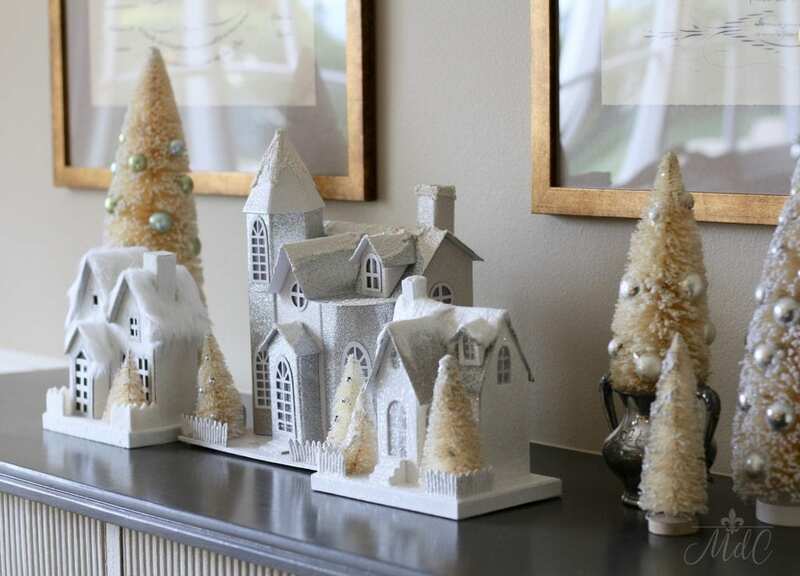 A grouping of little white houses and churches along with more bottle brush trees on the buffet. 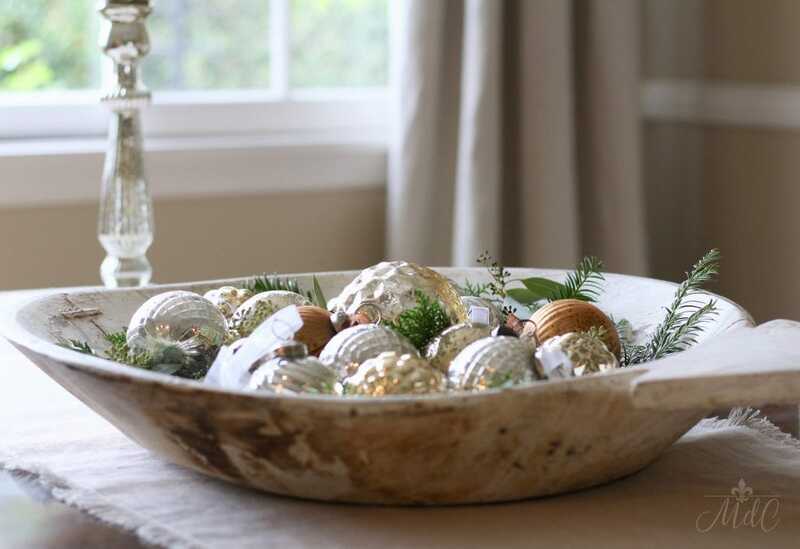 This unusual chippy white antique bowl holds a mix of mercury glass ornaments and some live greens. A grouping of different trees on the sideboard. Thank you again for stopping by! And Happy Holidays from our home to yours! Happy Holidays to you, and thank you so much for your lovely comment! 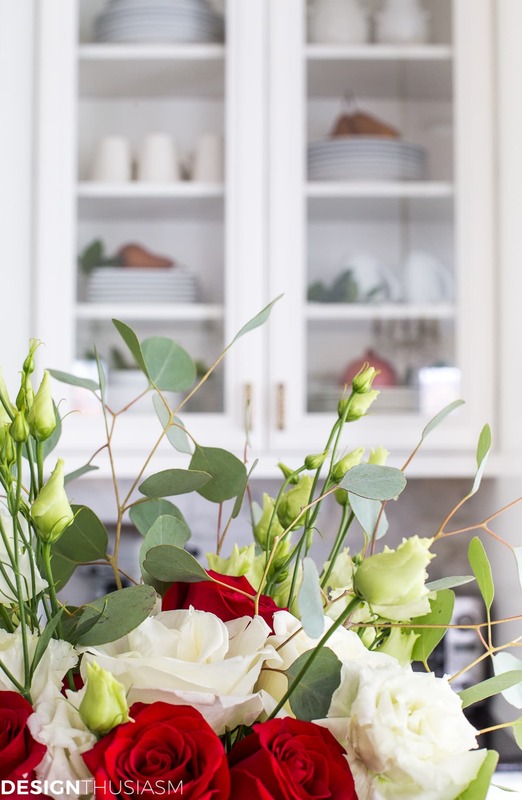 I love everything about your home! Could you please tell me the color of paint on the living room and dining room and kitchen walls? Hi Patti, and thank you so much for your lovely comment! All my walls are painted with Benjamin Moore. The living and dining rooms are Muslin and the kitchen is slightly different, it is Monroe Bisque. I’m actually painting the kitchen walls soon, haha! The Monroe Bisque looks a little yellow and I’m thinking I’d like everything the same. Anyway, hope that helps you! And thank you again for such kind words, and for reading! So appreciated! Sheila, if you were to go into my dreams and create the perfect home for Christmas, yours would be straight out of my dreams. I LOVE EVERY SINGLE DETAIL! I have been trying to wrap my head around my style – it’s changed so much – and you just nailed it perfectly. I love your style – and am now your newest follower. 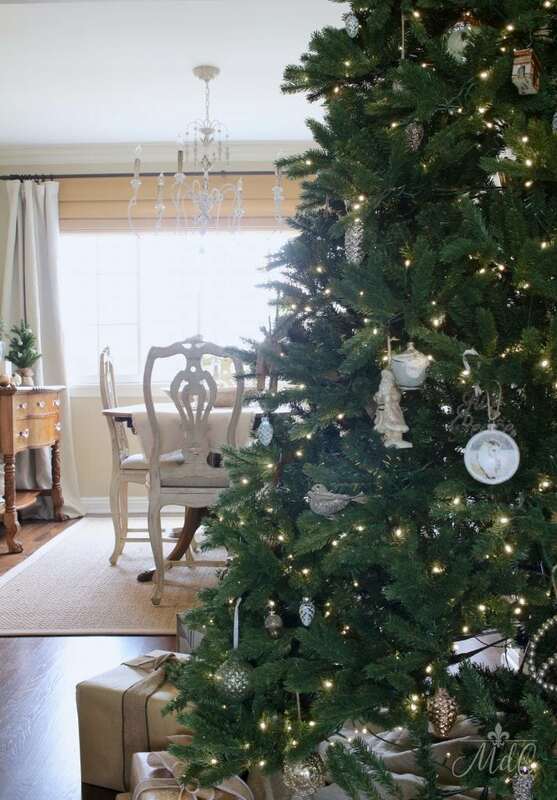 Well done – your home is a stunning beauty and your decorating skills are awesome and inspiring! Will you please come to Ohio and help me? LOL. I do know what you mean about “finding your style” though, as it can be hard to do – it even was for me. But I’m sure you’ll figure out what’s right for you and I’m just glad to be able to help inspire you in even the smallest way! Thanks again for stopping by and for following along, I’m so glad to have you here! What a beautiful tour Sheila! I love your bottle brush tree collection. I also want to say thanks for stopping by. I love seeing my friends over on the blog! Such a beautiful tour, Sheila! Your home is so elegant and I love all the sparkle of the Christmas decor. Gorgeous! Sheila, your house looks stunning decked out for the holidays. I love those cute stockings! 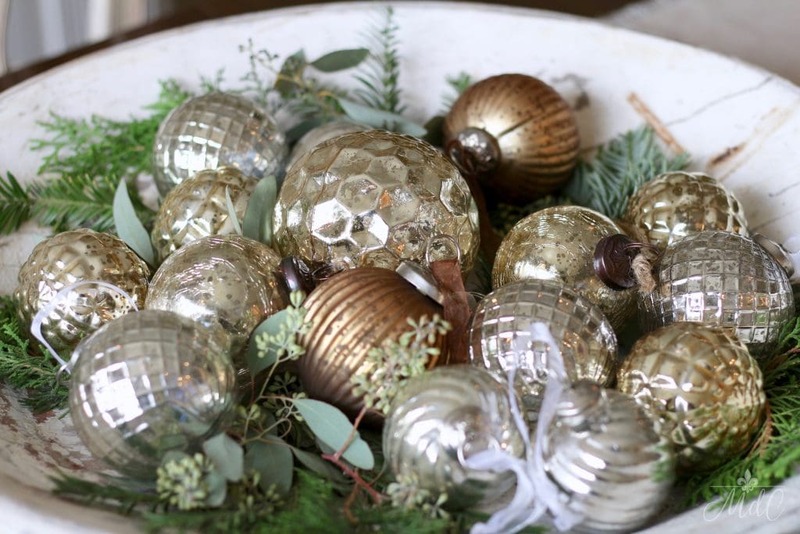 The mercury glass ornaments in the dough bowl are fun – I am sure at night the light catches them! 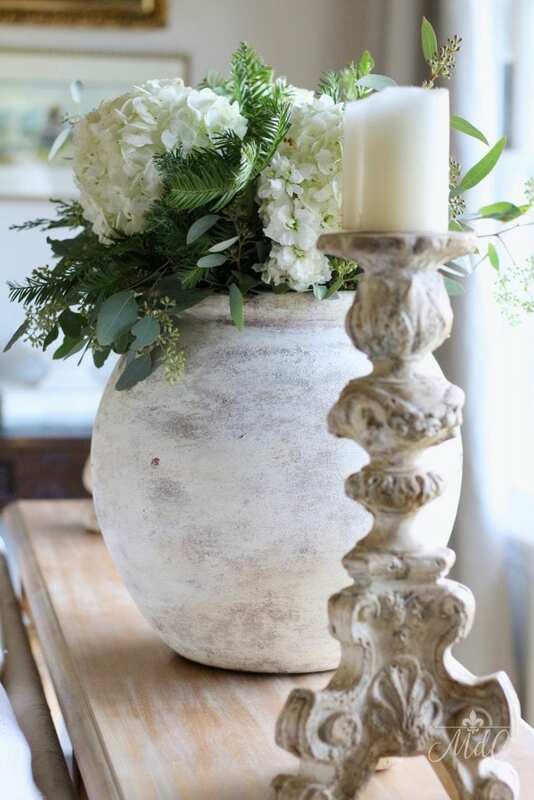 I also love your French urn with fresh greenery! 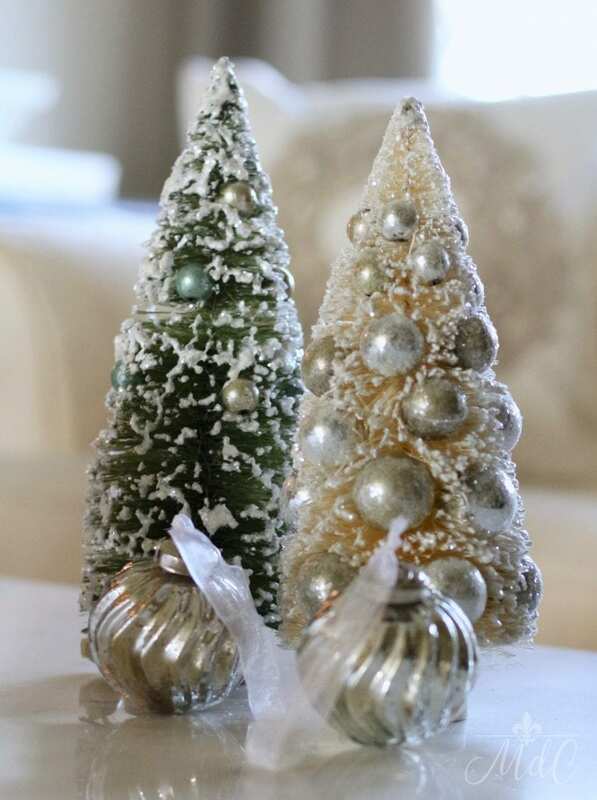 Oh and of course those little bottle brush trees, I have some similar ones! Thanks so much Angelina! I can’t wait to see your new gorgeous home all decked out! Sheila, I’m crazy in love with every inch of your home! Your style just speaks to me 100%. One photo is more beautiful than the next and I can’t pick out what I love the most, because I love it all!! But the overall effect is really what I love most. Just beautiful! Thanks so much for having me -LOVE doing these hops with you! 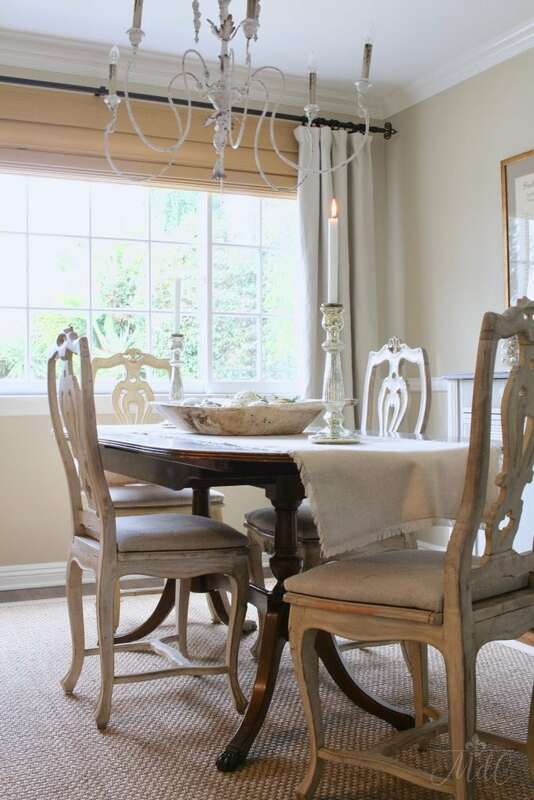 I love your chic neutral French Country style Sheila! 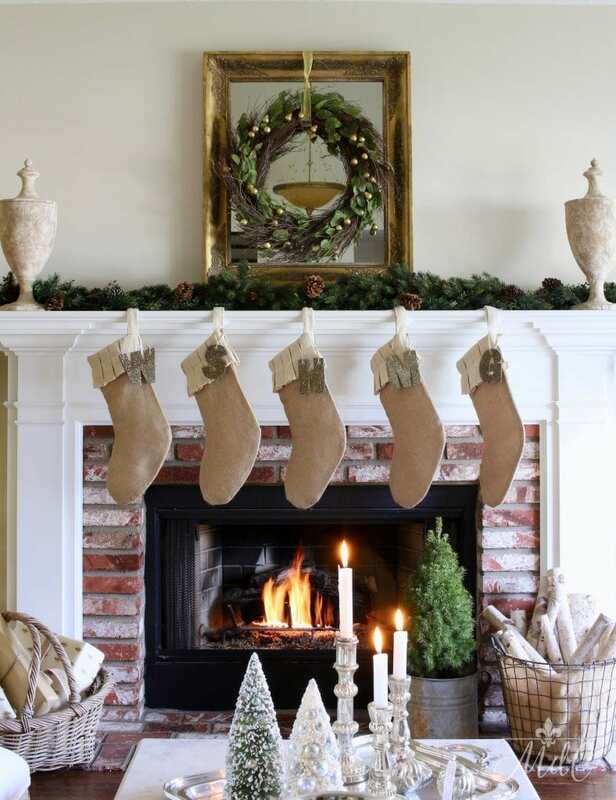 The stockings on the mantle are such a beautiful touch. 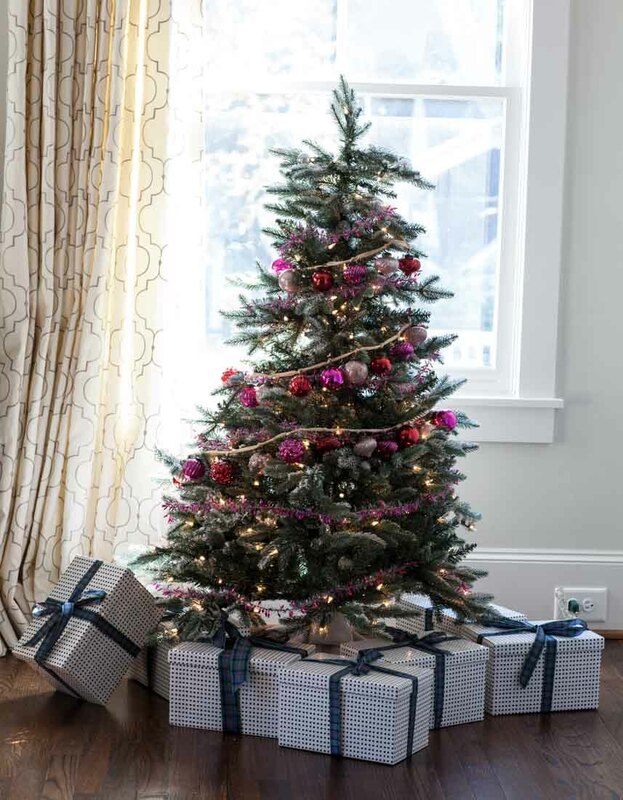 And your tree is absolutely gorgeous. Can’t wait to see more over the coming weeks! A happy week to you! So pretty Sheila!! I love your style and home. Thank you so much Courtney! So happy to be doing this tour with you! 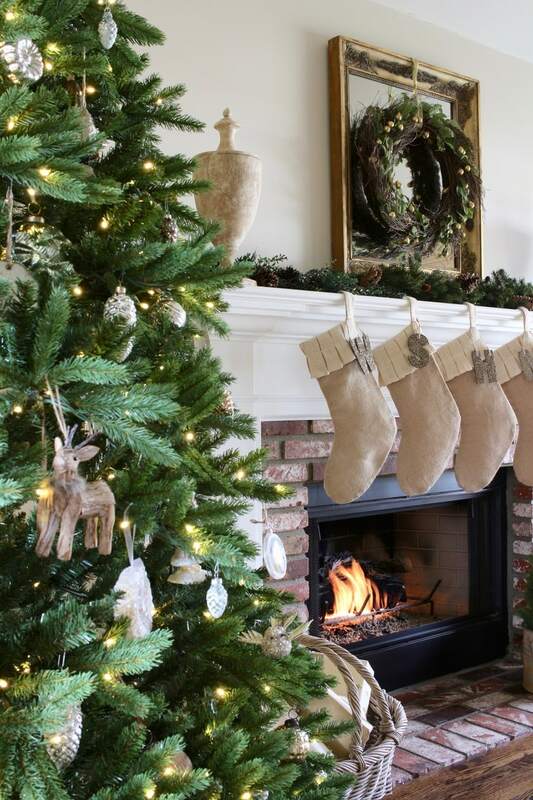 Sheila, your home is so pretty all decked out for the holidays! 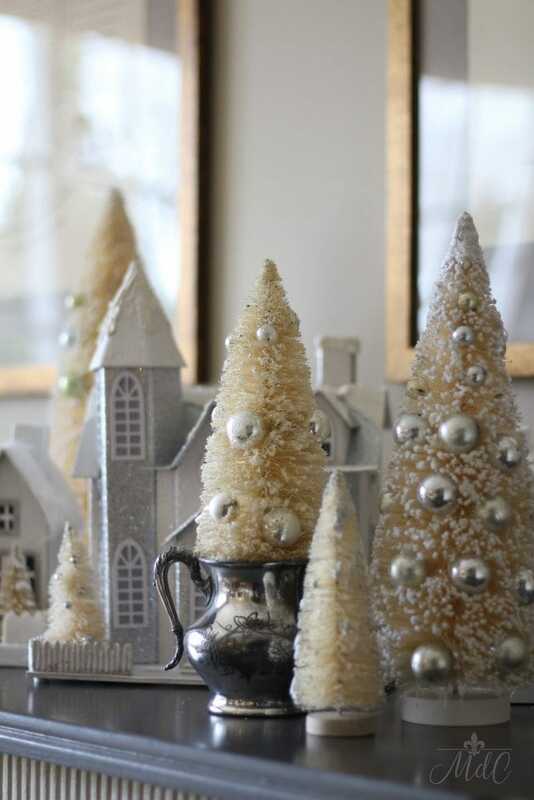 I love those bottle brush trees….I only have a couple but now I’m thinking I need to find more for a grouping! Thanks for the inspiration! 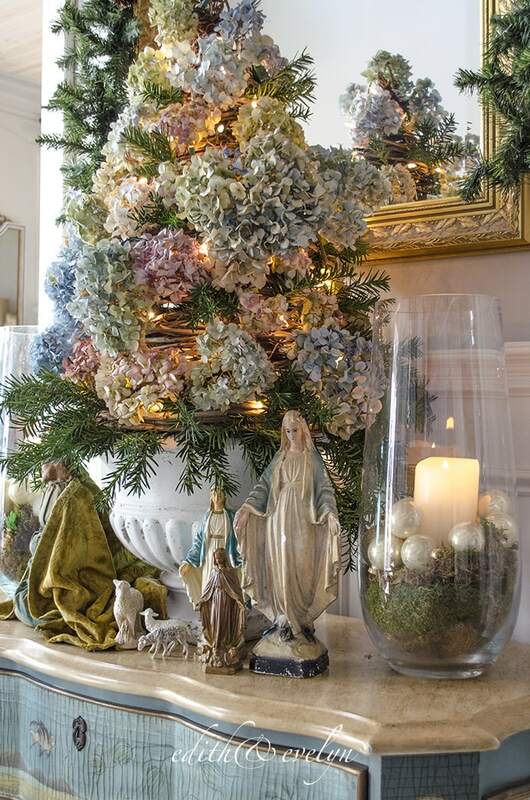 So very beautiful Sheila…I have enjoyed every beautiful and creative detail of your home for Christmas from the mantel to the bottle brush tree vignettes. 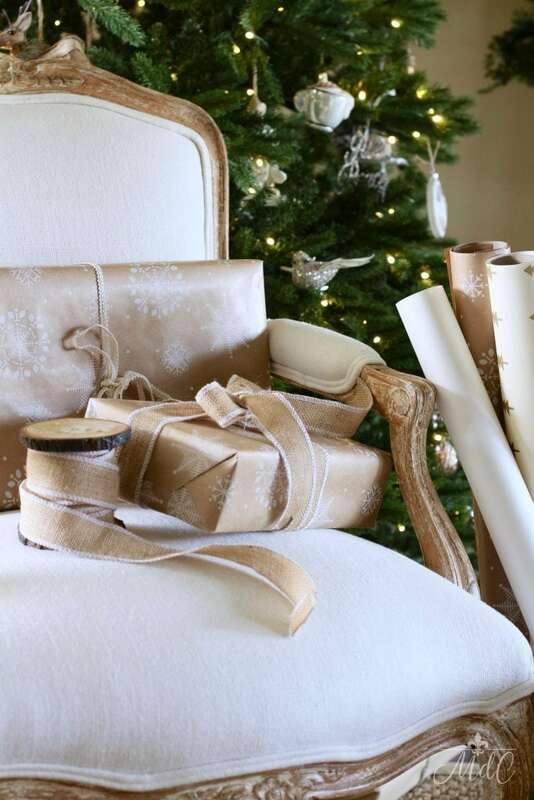 Have a great day and happy Holiday decorating! Thank you Shirley! And thank you so much for stopping by! That is so sweet! And I’m the same way! 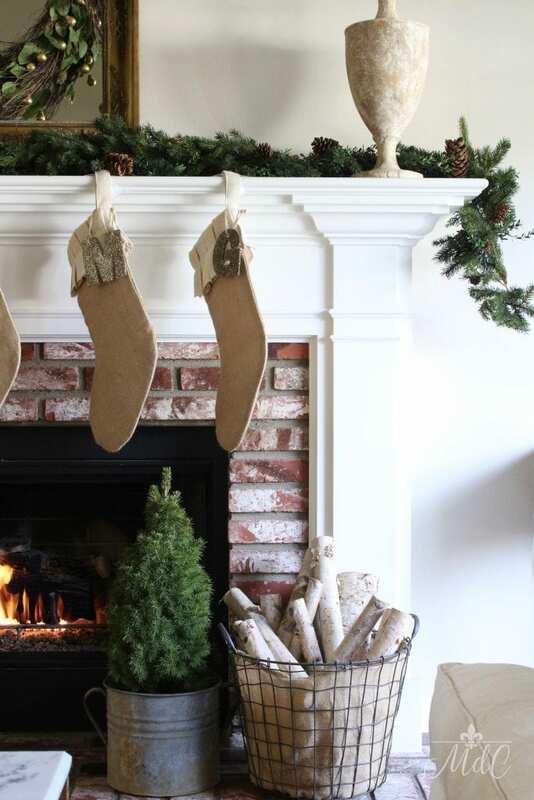 Give me any vintage-style Christmas decor and my heart skips a beat:) And thank you for the lovely compliment – that truly warms my heart. I so appreciate you stopping by, and for taking the time to comment! Happy Holidays! Sheila, your home is so pretty and I love your Christmas additions. It amazes me what nice things you can find at HomeGoods. 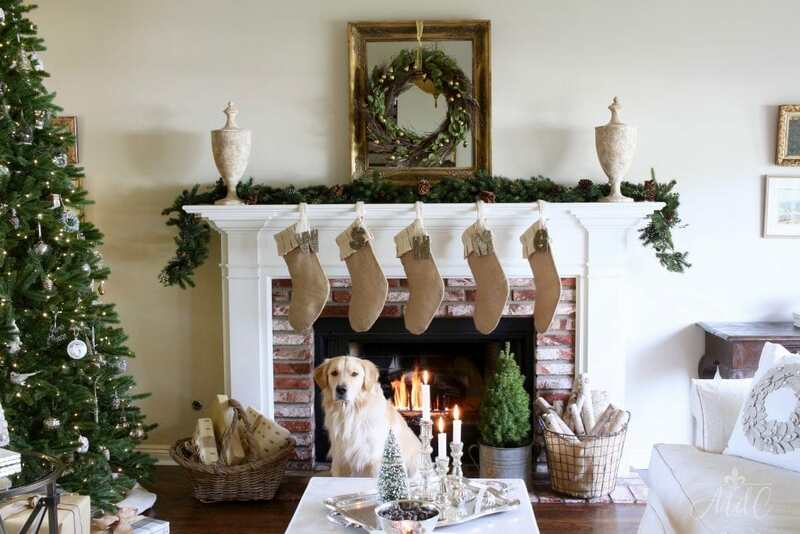 Those stockings are perfect. Right?! I totally agree with you! I love my vintage and antique items, but when I can’t find things that I need or want, Home Goods usually fits the bill! And thank you for your sweet comment – I so appreciate it Kim!